When most of us think about planting flowers and maintaining a garden at home, we think about doing so in either our front or backyard, perhaps along our walkway or up against our fence. However, there’s another type of garden to think about, one that is a bit more unique – a rooftop garden. 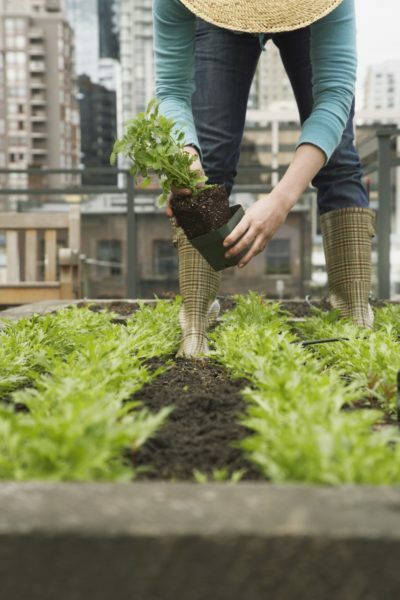 Although rooftop gardening isn’t necessarily new, it’s something we hear more about lately. If you’re hoping to get on board with this garden trend, take a look at our tips below before you get started! Are you allowed to build a rooftop garden? Depending on where you live, there may be certain rules and regulations about growing a garden on top of your home. So, before you do anything, make sure your speak with your landlord and/or research building codes for your neighborhood – there may be restrictions on things like how tall your garden can be. Can your roof support a garden? Your roof is designed to support a certain amount of weight, but keep in mind that a garden can push the weight over that limit. That’s because soil is heavy to start with, and as you add water and pots (and ultimately, as your plants and flowers grow), things will start to feel even heavier. Is your roof easily accessible? The time when you actually build your garden and complete your planting isn’t the only time you’ll need to access your roof – you’ll also need to be able to reach it when it comes time to do things like water. That said, you’ll need to think about the ease of accessing your plants and flowers, including whether or not it’s easy to get your garden hose up there. Do you have room to store your gardening tools? You probably aren’t going to want to carry your gardening tools up to the roof each and every time you need to do some maintenance, so you’ll want to think about leaving some space for storage. If you do have the room to add things like shelves or bins, again, don’t forget to think about whether or not your roof can support the added weight. Are the growing conditions ideal? If the answer to all of the above is “yes,” think about the growing conditions plants and flowers will experience on your roof – is the area shaded by trees or nearby buildings? Does it receive too much sun to the point where the heat is extreme? You wouldn’t want all of your hard work to be compromised by nature, so you’ll need to figure out if your plants and flowers could survive under the given circumstances. Even when your roof can withstand the weight, try to make things as light as possible. That means using materials such as plastic or fiberglass, and always aim for the lightest potting soil rather than your typical garden dirt. Take wind into account! Since your garden will likely feel the wind more on the roof than on the ground, you’ll want to look into adding something like a trellis – windbreaks like these can help reduce the negative effects your plants and flowers may feel from strong gusts. Have a garden hose that doesn’t reach? Then you probably want to look into having a watering system installed that does – water storage systems are also a great idea too. Although rooftop gardens may require a bit of extra work and a little extra thinking to get started, we love the way they look when everything starts to grow and bet that you will too! Would you consider building a rooftop garden instead of, or in addition to, a traditional garden this year?